Imagine if you were led to believe as a boy that you were destined to become humanity’s saviour – that you were going to lead the human race to ultimate victory over a machine army. Imagine being pulled from one place to the next as your mother seeks to get you trained with the skills you’ll need to succeed. Then imagine that, one day, your mother is arrested and you’re told she was filling your head with complete rubbish – that everything she told you was the result of her delusions. 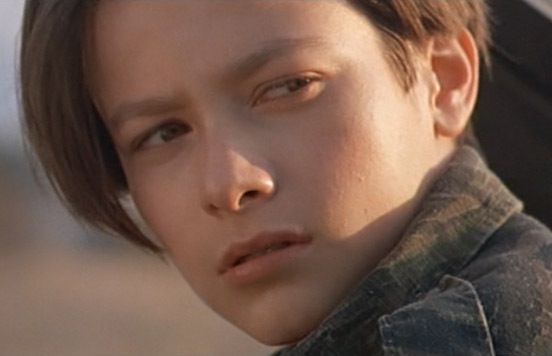 Such is the childhood of John Connor. When we first see him in Terminator 2, he is a ten year-old delinquent – rebellious and into petty crime -and no-so-petty crime. John has learned how to hack peoples’ bank accounts – and he puts this to good use early on! He is bitter – as anyone would be – after learning the truth about his mother. His entire world comes crashing down around him – and then, it happens again. He meets the Terminator sent back in time to save him – and meets another one sent to kill him. In the space of one afternoon, he goes from believing everything his mother told him was a lie – to nearly getting killed, and finding out she was in fact, completely right. What John discovers about himself is that he is tougher than he first realises. He chastises his mother when she tries to smash his protector’s control chip, and sets out to stop her from killing Miles Dyson. He places himself in danger to help destroy Skynet before it ever exists, and doesn’t leave Sarah’s side, even when it seems the T-1000 has them cornered. Flash forward several years, and John has taken to living ‘off the grid’. Although Judgement Day never happens, he can never quite shake the feeling that he needs to lay low. He leaves no electronic trail for any would-be Skynet assassins to track from the future, and drifts from place to place. By this point Sarah has died, so John is alone – and he has to face his demons alone when it transpires Judgement Day was never stopped – only delayed. A new Terminator is hunting him, but once more John has a defender in the form of a Terminator – albeit one far inferior to the T-X. He is forced to face reality – that he will lead humanity to victory but only after nuclear war destroys much of civilisation. Although John has grown up knowing he is the one who will lead the human race to ultimate victory over Skynet, the remnants of military forces around the world naturally do not appoint a civilian to command their resistance. 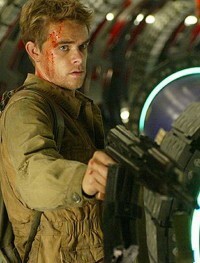 Though Connor gets to lead a large team, he is not the leader, and clashes heads with the leadership in Salvation. He doesn’t want to act in cold blood by sacrificing prisoners to destroy Skynet bases, as he doesn’t want humanity to stoop to Skynet’s level. He also doesn’t want to blow up his own father (understandable!). By the time Salvation ends, the core command of the Resistance is dead, but John succeeds in destroying a key Skynet factory where T-800s are being built. By 2029, where we see John Connor leading Resistance fighters against Skynet forces, he has taken command of the Resistance and smashed Skynet’s defence grid, effectively winning the war. He does, ultimately, become a ‘Great Military Leader’.